My favorite part of Web design is learning new things, so I’m always looking for new books on the subject. We’re still trying new things, but we’re out of the browsers-changing-daily era of Web design. There’s not a whole lot more anyone can say about HTML or XHTML, which leaves CSS as the next big topic. But we’re past the point of needing books to tell us the mechanics of CSS, even for positioning. We’ve been doing that for a while, plus browsers haven’t been changing much, and the old books work. A new type of CSS book has moved into the gap, like The Zen of CSS Design , which illustrate how CSS can be used as part of your design toolbox to create fantastic Web sites. 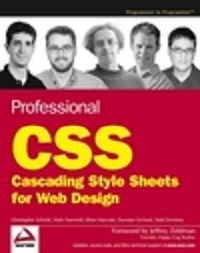 Professional CSS: Cascading Style Sheets for Web Design is in a new class of CSS books. It doesn’t teach you how to write CSS, it teaches you how to use it. I read a pre-publication copy of Professional CSS . The first thing this book has is a lot of authors. I’ve read other Web design books written by teams of authors, most memorably CSS: Separating Content from Presentation from Glasshaus, where a different author wrote each chapter. I suspect that the difficulties of merging a lot of different voices led to many of the problems I had with the book. Except for the first two, each chapter examines a different Web site and how the designer uses CSS on that site. The first two chapters are a quick intro to CSS to make sure we’re all starting from a common base. I question the need for that here. I can’t imagine that someone who hasn’t at least heard of XHTML will get anything out of this book. That point aside, explanations of site planning have been done much better elsewhere. Take a look at Blueprints for the Web or Web Design on a Shoestring or even the later chapters of this book. Best practices for XHTML and CSS sounds interesting, but the chapter doesn’t really talk about best practices—it simply describes XHTML and CSS basics. Is making all elements and attributes in XHTML lower case a best practice? All is not lost—there is an excellent explanation of the cascade in the second chapter. Luckily, I didn’t stop reading after the first two chapters. There is excellent material in here, I just had to work a little bit to find it. Each of the remaining chapters was very different, a definite strength. Topics ranged from low-level coding examples (how to style a list as navigation) to high-level CSS usage (using CSS to change the layout of ESPN’s home page depending on the importance of the lead story). The great variety of topics gave me ideas for my own sites, like having three kinds of importance for news items, instead of trying to shoehorn everything into h1, h2 and h3 tags. Sometimes one h2 is more important than other h2s. The book helped me think more creatively about content structure. I particularly liked seeing the evolution of the University of Florida’s home page. In three images the author illustrates the history of Web design. The interviews with the designers were also very good. Even though I keep up with the Web design community on the Internet, I don’t often talk with other Web designers who share my design philosophy. These interviews were designer-to-designer conversations. I didn’t always agree with the design decisions, especially when dealing with IE’s inadequacies. If 80% of my audience isn’t going to see a particular effect, I really don’t understand spending time on that effect. But the explanations were still interesting. The appendices have good information in them, particularly the one on troubleshooting CSS. The illustrations are excellent. They are large and really help you see what they are talking about and the authors go through the CSS examples step-by-step. Professional CSS is a solid book on using CSS. I can’t recommend it as a must-have, but if you’re looking for some CSS summer reading (you know, for the beach where it’s too bright for your laptop), this book will do nicely. How different Web designers use CSS on their sites. Most of the examples are big sites, showing CSS is being used by the big players. Mid- to high-level CSS coders. You’ll get the most out of this book if you know what a selector is and you’ve played around with CSS positioning. Step-by-step code examples with great diagrams. Interviews with the designers. Solid book on using CSS. Karen Morrill-McClure is a freelance Web designer in Southern California who reads manuals for fun (and maybe someday profit). Her personal blog is Musings.